An incomplete silver book fitting or clasp. The fitting is formed of a flat sheet of silver with a curved tab at one end, now broken. The fitting had a trilobed terminal with a central circular silver rivet in situ. The terminal narrows in width before expanding to a rectangular collar. The main body of the plate extends from the other side of the collar and expands centrally before narrowing to another rectangular collar. The tab, narrowed in width, extends from the collar and curves 180 degrees towards the back, terminating in an old break. The front of the fitting is decorated with punch decoration forming a double line mimicking the exterior shape across the main body, trefoil terminal and the rectangular collars. On the lower collar, before the curving tab, is a central heart flanked by a cross or quatrefoil with central pellet. The back in plain. Dimensions: Length: 37.7mm, width: 9.1mm, thickness: 3.0mm, weight: 2.42g.. 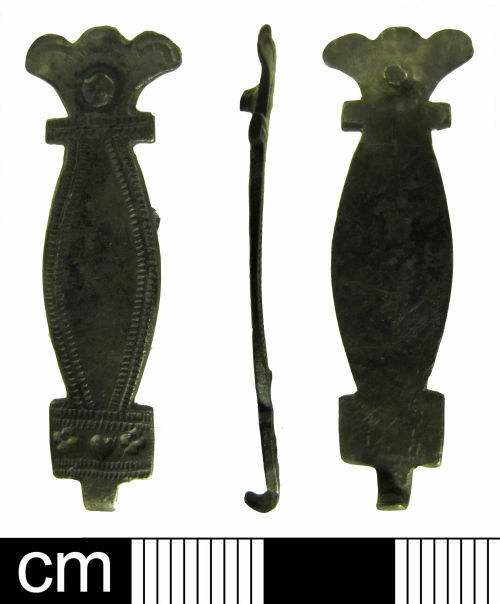 Discussion: An example with similar shape and punch decoration dated to the Post Medieval period was found in a neighbouring field and is recorded on the PAS database: BUC-507330 (2010 T733).